The death toll from wildfires in Greece rose to 91 on Sunday. The death toll from wildfires that swept through a seaside area of Greece last week rose to 91 on Sunday and officials said 25 people remained missing. The number of people killed climbed from 86 on Saturday as search-and-rescue crews continued to search the widespread rubble on the outskirts of Athens. 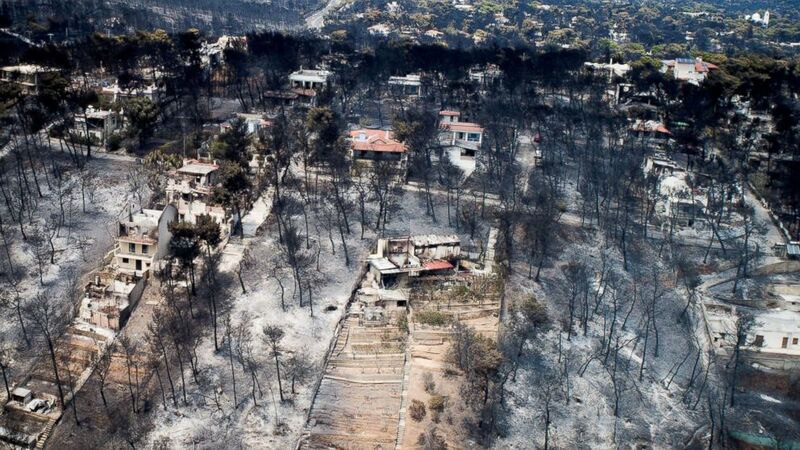 (Antonis Nicolopoulos/Eurokinissi via Reuters) An aerial view shows burnt houses and trees following a wildfire in the village of Mati, near Athens, Greece, July 25, 2018. Dive teams kept searching the sea off the shores of Mati, Rafina, Neos Voutzas and Kokkino Limanaki where many people fled to escape the fires, officials said. Nearly 200 people, including children, were injured in the blazes. The fire broke out in multiple places simultaneously in forest areas on July 23. Fanned by winds of up to 60 miles per hour, the fires quickly grew into raging infernos. Many people said they ran to the beach and dove into the sea, treading water for several hours before being rescued. Government officials said last week that investigators found "serious indications" that the fires were deliberately set, saying they were started in at least 22 different locations. Nikos Toskas, the country's public order minister, told reporters at a press conference on Thursday that satellite image analysis and ground inspections suggest the fires were the work of arsonists. "We have serious indications of criminal acts... lots of fires appeared in a very short period of time," Toskas said during the press conference. 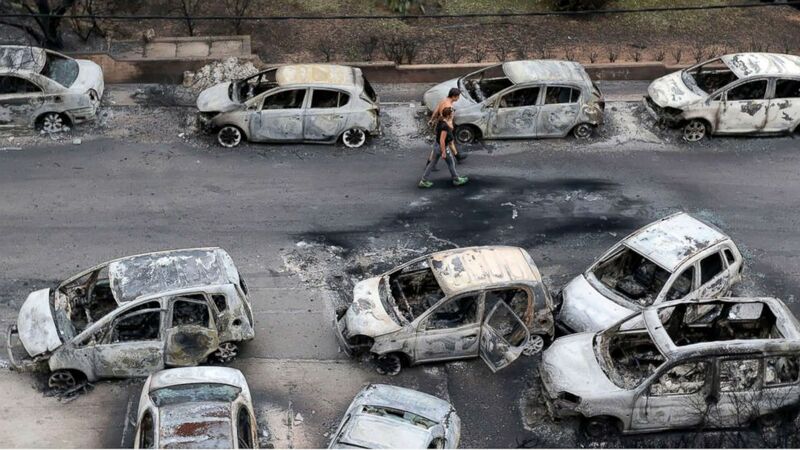 More than 1,000 homes and 300 vehicles were either destroyed or damaged by the fires, officials said. It was the worst wildfire to hit Greece since August 2007, when fires erupted in the outskirts of Athens, killing 67 people.